Our desire to consume more value than we create has led directly to our current economic woes. 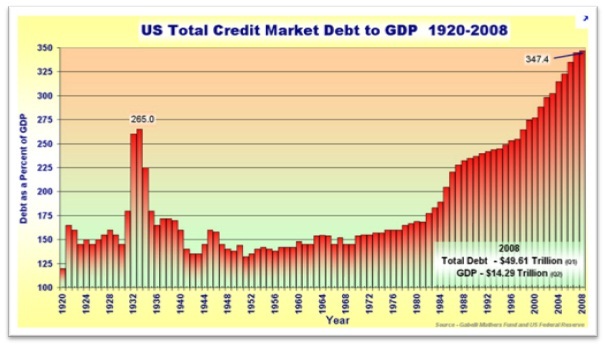 Indeed, if countries live far beyond their means for far too long (such as America and much of the Western world) a massive credit crisis is the most natural result. People seem to have real problems grasping the basic fact that, if you want to consume more, you also have to produce more. As an example, America has increased welfare and healthcare spending tremendously while fighting two simultaneous wars and lowering taxes. Wow… who in their right mind would think that this could ever work? The above graph is simply a visualization of consumerism gone wild. Cheap credit provided by the Fed has allowed people to consume way beyond their means for decades. Unfortunately, the over-consumption party has now come to a close and will most likely result in the longest recession in our history. But still, US and EU leaders still see further unsustainable spending as the only way out. Albert Einstein said that the definition of insanity is doing the same thing over and over again, each time expecting a different result. He also said that we cannot solve problems with the same thinking that has created them.